Next Sunday is the Easter holiday for the Christian calendar. Traditionally it’s a season of new clothes and shoes, big hats, tulips along Park Avenue in New York, and baskets filled with candy. In our family, as to be expected, there are also a few other memories of the season. While visiting family in the Midwest a couple of months ago, I’m not quite sure how the topic got started, but my sisters and I talked about the subject of Easter Sundays gone by and the presents from the Easter Bunny. Again, this link between food and holidays is very strong, as we discussed those malted milk ball eggs (cleverly disguised as gumballs), green plastic Easter grass stuck to the bottom of the jelly beans, and why we never seem to get the candy we really like (Pez® = good; marshmallow anything = bad). This year’s Easter Brunch Menu can be a good start to putting all the awful candy memories to rest. As with the other recipes I’ve posted, part of this can be prepared in advance (even the night before), to save time the day of the event. In fluted glasses, fill glass 1/3 the way with champagne/sparkling wine/water, 1/3 with freshly-squeezed orange juice, and the rest with blood orange juice. 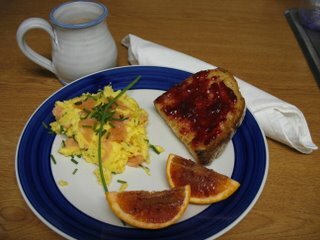 The sweet-tart flavor of the blood oranges (and their deeper color) will add the sunrise touch. Slice potatoes into 1/4-1/2-inch chunks, precision isn’t necessary as they will be smashed later. Put potatoes in saucepan and cover with water; bring to a boil. Let cook for 10-15 minutes or until potatoes are tender (a knife inserted into them breaks them apart). Remove pan with potatoes from heat and drain out water. Return potatoes to pan. The residual heat will draw out any remaining water. With a wooden spoon, smash potatoes. Make more or less lumpy depending upon your preference. Melt butter in non-stick skillet (key as this will allow you to get the potatoes crispy without burning them), at least 10-inches wide, over low heat; put in olive oil. Swish together to blend. Add onion and cook for 3-5 minutes over medium to low heat, until onions are soft and translucent. Add potatoes and cook for 10 minutes, stirring to keep potatoes from sticking to the bottom of the pan and to mix them together with the onions. At this point, for those who prefer more a crispy to creamy consistency, cook the potatoes for 5 or so more minutes, keeping in mind not to allow them to burn. Season potatoes with salt, pepper and dill. Stir to incorporate thoroughly. Keep in mind that the salmon may also add more salt to the finished dish. Add cream and stir again. Cook for 1-2 minutes more to meld flavors. At this point, the mixture may be prepared in advance. * At the last minute, stir in chopped smoked salmon. Make scrambled or poached eggs according to your favorite recipe. Place a mound of the potato mixture on a plate. Garnish with slivers of sliced smoked salmon. 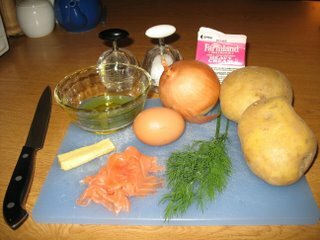 Place poached egg or scrambled eggs on top or to the side of potatoes and salmon. Add an extra sprinkle of dill. At this point, the potatoes can be cooled and stored in the refrigerator. This is the thing to do to get a head start on a Sunday brunch. Then, shortly before the guests arrive, prepare the salad and dressing, reheat the potatoes (adjusting the seasoning), make the eggs and the mimosas, and get the table ready. Alternative Serving Suggestion: This goes out to Jax – nice try on the No Potatoes for Lent gig. Betcha gave up spinach, too. You’re supposed to give up something you actually like – how about trying March Madness next year. 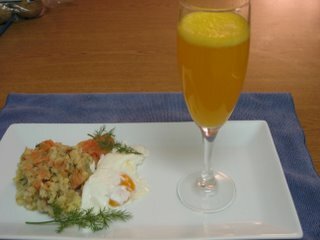 Make scrambled eggs using your favorite recipe, add chopped salmon and chives at the last stage of the cooking process. Put on a plate, garnish with slivers of smoked salmon. Top with a dollop (about one teaspoon) of sour cream. Add a teaspoon of salmon roe on top of the sour cream (very optional). Garnish with additional chopped chives. Put lemon juice in a glass or ceramic bowl; add mustards. Whisk together thoroughly. Add in shallots, salt and pepper. Whisk again to incorporate. 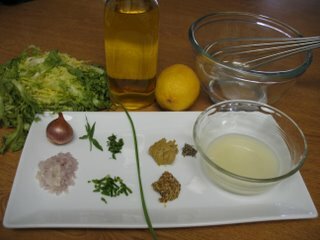 While continuing to whisk mustard mixture, gradually add olive oil in a steady stream, at a ratio of 2:1, oil to mustard. You will have about 1/2 cup total of liquid. Place frisée on plates. Drizzle vinaigrette on top of frisée. Sprinkle with the chopped herbs. 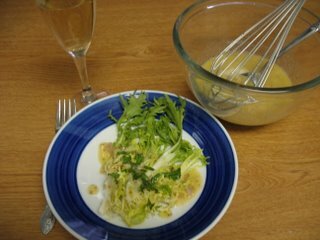 You may wish to taste the vinaigrette prior to serving, using a piece of the frisée to see if the oil-to-mustard ratio is balanced to suit your tastes. As chocolate is usually what I give up for Lent, breaking this fast is part of my Easter tradition. For you, it might be different. So, dessert following this brunch could be anything sweet. You could surreptitiously try to sneak some jelly beans from your child/ren’s basket(s) – carefully to pick off the Easter grass before you stick them in your mouth. And, there’s always ice cream sundaes using the crushed, dreaded malted milk balls as a topping. Yum, yum. I leave it to you to decide what is appropriate. Hmm...maybe for Easter Sunday, your sweetie can make some for you - hint, hint. The mimosas are quite delish as well. Maybe baseball season will be nicer to you. Have you thought about learning cricket? Heard that you caught Jon watching darts on telly! The photos are great! I'll have to try this one. I grilled a salmon on Sunday (not for easter, but b/c it was going to die soon if I didn't) and I might sprinkle that on top. Granted it was marinated in teryaki sauce but I almost tasted smoked (since I marinated it waaaaayyyyy toooo llooooonnnnngggggg).